William Henry Sugg was born in Yeovil during 1880. He was the only son of glove cutter Henry George Sugg (1842-1895) and his second wife Eliza Mary Ann née Brooks (1841-1918). William did, however, have three older half-brothers by his father's first wife Christiana Watts (1842-1876); Henry C (1871-1872), Samuel (b1872) and Charles (1873-1914). In the 1881 census the family were recorded at South View Cottage, Lansdown, Bath, but by the time of the 1891 census the family had moved back to Yeovil. They were living at 7 Huish. Henry and his two elder sons were all working as glove cutters while 11-year old William was employed as an errand boy. On 18 September 1904 William married Mary Amelia Shire at Hardington Mandeville, Somerset. They were to have five children; three boys and two girls. In the 1911 census William and Mary were listed at 18 Salisbury Terrace, Reckleford, with their three eldest children; George WT (b1906), Dorothy AG (b1910) and Mildred M (b1911). William gave his occupation as a leather glove sorter. The family later lived in 15 Market Street. William enlisted at Taunton, joining 2/10th (County of London) Battalion (2nd Hackney Rifles), London Regiment, Rifle Brigade (The Prince Consort's Own). His Service number 47925 suggesting an enlistment during the summer of 1917. The 2/10th Battalion, raised in September 1915, and initially under orders of 2/2nd London Brigade in 2/1st London Division, but retitled as 175th Brigade in 58th (2/1st London) Division from June 1915. The 2/10th was a 2nd-line Territorial unit, initially only volunteering for Home Service. However the battalion had been fighting in France since February 1917. William joined his battalion there on 13 October 1917. We don't know specifically where William fought but he was hospitalised at No 15 Casualty Clearing Station, some time before 17 October 1918, because of a severe shell gas wound. The Casualty Clearing Station was part of the casualty evacuation chain, further back from the front line than the Aid Posts and Field Ambulances. It was manned by troops of the Royal Army Medical Corps, with attached Royal Engineers and men of the Army Service Corps. The job of the CCS was to treat a man sufficiently for his return to duty or, in most cases, to enable him to be evacuated to a Base Hospital. It was not a place for a long-term stay. CCS’s were generally located on or near railway lines, to facilitate movement of casualties from the battlefield and on to the hospitals. Although they were quite large, CCS’s moved quite frequently, especially in the wake of the great German attacks in the spring of 1918 and the victorious Allied advance in the summer and autumn of that year. Many CCS moved into Belgium and Germany with the army of occupation in 1919 too. The locations of wartime CCSs can often be identified today from the cluster of military cemeteries that surrounded them. William was later transferred to No 6 Casualty Clearing Station, where he died from his wounds on 21 October 1918. He was 39 years old. In its edition of 1 November 1918 the Western Gazette reported "Mrs Sugg, 15 Market Street, on October 15th received a telegram from the Record Office that her husband was lying dangerously ill at 15 Casualty Clearing Station, France from shell gas wound. In a letter the Chaplain, on October 22nd, said Rifleman Sugg was being transferred to another hospital close by on that day, Thursday, October 17th, so every hope was entertained of his recovery, but in a communication from the War Office on October 29th, it stated that Rifleman Wm. 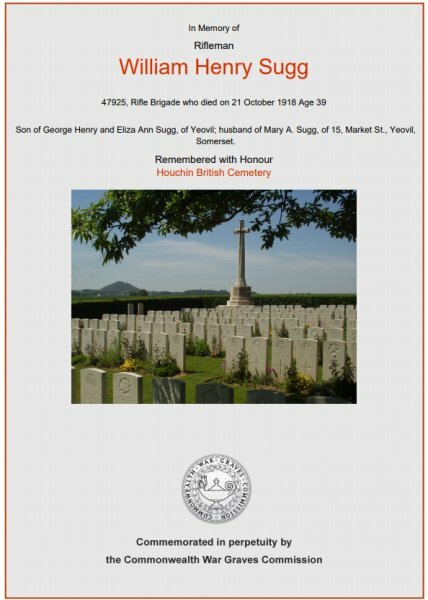 Henry Sugg, of the Rifle Brigade, had died on October 21st of shell gas wound at No. 6 Casualty Clearing Station, France, and enclosing a letter of sympathy from the King and Queen. Rifleman Sugg went to France with the 13th Platoon of that Regiment on October 13th last, being home on leave the week before. He was 37 years of age, and leaves a widow and five young children." 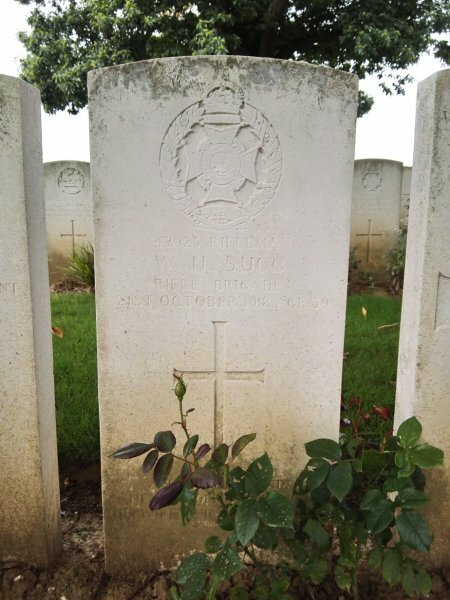 William Sugg was interred in Houchin British Cemetery, Pas de Calais, France, Grave III.A.27. His name is inscribed on the War Memorial in the Borough. 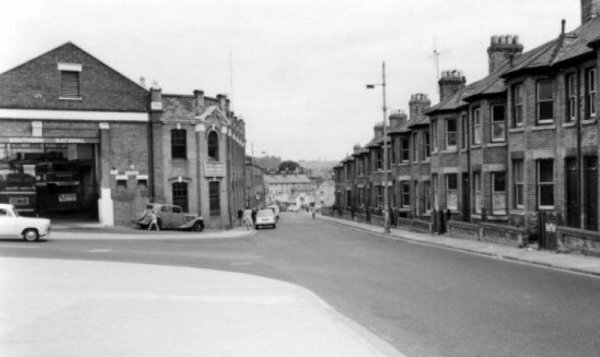 Looking down Reckleford in the early 1960's with Goldcroft and the Nautilus Works at left and Salisbury Terrace at right, where William Sugg and his family lived at No 18. Stretcher cases awaiting transport to a Casualty Clearing Station lie on the ground outside a Dressing Station. William Sugg's Commonwealth War Graves Commission headstone. The Commonwealth War Graves Commission certificate in memory of William Sugg. Houchin British Cemetery, Pas de Calais, France. The cemetery was opened in March 1918 when the 6th Casualty Clearing Station came to Houchin. From April to September the German advance made Houchin unsafe for hospitals, and the cemetery was used by the 55th (West Lancashire) Division. In September 1918, the 6th Casualty Clearing Station returned to Houchin and was joined by the 15th Casualty Clearing Station in October. Houchin British Cemetery contains 700 Commonwealth burials of the First World War and two from the Second World War. There are also 39 German and one Belgian war graves. The cemetery was designed by Sir Edwin Lutyens.